This article is about scar tissue. For other uses, see Scar (disambiguation). "Scarred" redirects here. For other uses, see Scarred (disambiguation). "Scars" redirects here. For the 1998 video game, see S.C.A.R.S. (video game). A minor scar from a cut to the forearm, approx. one year since the wound. Scar tissue is composed of the same protein (collagen) as the tissue that it replaces, but the fiber composition of the protein is different; instead of a random basketweave formation of the collagen fibers found in normal tissue, in fibrosis the collagen cross-links and forms a pronounced alignment in a single direction. This collagen scar tissue alignment is usually of inferior functional quality to the normal collagen randomised alignment. For example, scars in the skin are less resistant to ultraviolet radiation, and sweat glands and hair follicles do not grow back within scar tissues. A myocardial infarction, commonly known as a heart attack, causes scar formation in the heart muscle, which leads to loss of muscular power and possibly heart failure. However, there are some tissues (e.g. bone) that can heal without any structural or functional deterioration. Man with visible face scars after a car accident. All scarring is composed of the same collagen as the tissue it has replaced, but the composition of the scar tissue, compared to the normal tissue, is different. 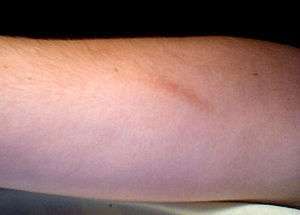 Scars differ from other scars in the amounts of collagen overexpressed. Labels have been applied to the differences in overexpression. Two of the most common types are hypertrophic and keloid scarring, both of which experience excessive stiff collagen bundled growth overextending the tissue, blocking off regeneration of tissues. Another form is atrophic scarring (sunken scarring), which also has an overexpression of collagen blocking regeneration. This scar type is sunken, because the collagen bundles do not overextend the tissue. Stretch marks (striae) are regarded as scars by some. High melanin levels and either African or Asian ancestry may make adverse scarring more noticeable. Hypertrophic scars occur when the body overproduces collagen, which causes the scar to be raised above the surrounding skin. Hypertrophic scars take the form of a red raised lump on the skin. They usually occur within 4 to 8 weeks following wound infection or wound closure with excess tension and/or other traumatic skin injuries. 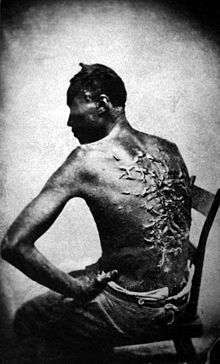 Keloid scarring on the back of Gordon, a man formerly enslaved by John and Bridget Lyons. People with darker skin pigmentation are more prone to the development of keloid scarring. Hypertrophic scars are often distinguished from keloid scars by their lack of growth outside the original wound area, but this commonly taught distinction can lead to confusion. Keloid scars can occur on anyone, but they are most common in dark-skinned people. They can be caused by surgery, accident, acne or, sometimes, body piercings. In some people, keloid scars form spontaneously. Although they can be a cosmetic problem, keloid scars are only inert masses of collagen and therefore completely harmless and not cancerous. However, they can be itchy or painful in some individuals. They tend to be most common on the shoulders and chest. Hypertrophic scars and keloids tend to be more common in wounds closed by secondary intention. Surgical removal of keloid is risky and may excerbate the condition and worsening of the keloid. An atrophic scar takes the form of a sunken recess in the skin, which has a pitted appearance. These are caused when underlying structures supporting the skin, such as fat or muscle, are lost. This type of scarring is often associated with acne, chickenpox, other diseases (especially Staphylococcus infection), surgery, certain insect and spider bites, or accidents. Stretch marks (technically called striae) are also a form of scarring. These are caused when the skin is stretched rapidly (for instance during pregnancy, significant weight gain, or adolescent growth spurts), or when skin is put under tension during the healing process, (usually near joints). This type of scar usually improves in appearance after a few years. Elevated corticosteroid levels are implicated in striae development. Hypertrophic scarring one year after road rash on the right, and the original wound on the left. If a wound heals quickly within two weeks with new formation of skin, minimal collagen will be deposited and no scar will form. Generally, if a wound takes longer than three to four weeks to become covered, a scar will form. Deep second-degree burns heal with scarring and hair loss. Sweat glands do not form in scar tissue, which impairs the regulation of body temperature. The endometrium, the inner lining of the uterus, is the only adult tissue to undergo rapid cyclic shedding and regeneration without scarring; shedding and restoring roughly inside a 7-day window on a monthly basis. All other adult tissues, upon rapid shedding or injury, can scar. The scar is a result of the body's repair mechanism after injury in many tissues. Any injury does not become a scar until the wound has completely healed; this can take many months, or years in the worst pathological cases, such as keloids. To begin to patch the damage, a clot is created; the clot is the beginning process that results in a provisional matrix. In the process, the first layer is a provisional matrix and is not scar. Over time, the wounded body tissue then overexpresses collagen inside the provisional matrix to create a collagen matrix. This collagen overexpression continues and crosslinks the fiber arrangement inside the collagen matrix, making the collagen dense. This densely packed collagen, morphing into an inelastic whitish collagen scar wall, blocks off cell communication and regeneration; as a result, the new tissue generated will have a different texture and quality than the surrounding unwounded tissue. This prolonged collagen-producing process results in a fortuna scar. The scarring is created by fibroblast proliferation, a process that begins with a reaction to the clot. To mend the damage, fibroblasts slowly form the collagen scar. The fibroblast proliferation is circular and cyclically, the fibroblast proliferation lays down thick, whitish collagen inside the provisional and collagen matrix, resulting in the abundant production of packed collagen on the fibers giving scars their uneven texture. Over time, the fibroblasts continue to crawl around the matrix, adjusting more fibers and, in the process, the scarring settles and becomes stiff. This fibroblast proliferation also contracts the tissue. In unwounded tissue, these fibers are not overexpressed with thick collagen and do not contract. The fibroblast involved in scarring and contraction is the myofibroblast, which is a specialized contractile fibroblast. These cells express a-smooth muscle actin (a-SMA). The myofibroblasts are absent in the first trimester in the embryonic stage; damage then heals scar free; small incisional or excision wounds less than 2 mm also heal without scarring; and in adult unwounded tissues where the fibroblast in itself is arrested; however, the myofibroblast is found in massive numbers in adult wound healing which heals with a scar. The myofibroblasts make up a high proportion of the fibroblasts proliferating in the postembryonic wound at the onset of healing. In the rat model, for instance, myofibroblasts can constitute up to 70% of the fibroblasts, and is responsible for fibrosis on tissue. Generally, the myofibroblasts disappear from the wound within 30 days, but can stay around in pathological cases in hypertrophy, such as keloids. Prolonged inflammation, as well as the fibroblast proliferation can occur. Redness that often follows an injury to the skin is not a scar, and is generally not permanent (see wound healing). The time it takes for this redness to dissipate may, however, range from a few days to, in some serious and rare cases, a few years. Scars form differently based on the location of the injury on the body and the age of the person who was injured. The worse the initial damage is, the worse the scar will generally be. Skin scars occur when the dermis (the deep, thick layer of skin) is damaged. Most skin scars are flat and leave a trace of the original injury that caused them. Wounds allowed to heal secondarily tend to scar worse than wounds from primary closure. Early and effective treatment of acne scarring can prevent severe acne and the scarring that often follows. As of 2014 no prescription drugs for the treatment or prevention of scars were available. Chemical peels are chemicals which destroy the epidermis in a controlled manner, leading to exfoliation and the alleviation of certain skin conditions, including superficial acne scars. Various chemicals can be used depending upon the depth of the peel, and caution should be used, particularly for dark-skinned individuals and those individuals susceptible to keloid formation or with active infections. Filler injections of collagen can be used to raise atrophic scars to the level of surrounding skin. Risks vary based upon the filler used, and can include further disfigurement and allergic reaction. Nonablative lasers, such as the Starlux Non-ablative FDA approved laser by Palomar, 585 nm pulsed dye laser, 1064 nm and 1320 nm Nd:YAG, or the 1540 nm Er:Glass are used as the standard laser therapy for hypertrophic scars and keloids. This therapy smooths the epidermis via contact cooling. Multiple sessions are usually required for a significant reduction in redness and improvement in the texture and pliability of hypertrophic scars and keloids. Ablative lasers such as the carbon dioxide laser or Er:YAG offer the best results for atrophic and acne scars. Like dermabrasion, ablative lasers work by destroying the epidermis to a certain depth. Healing times for ablative therapy are much longer and the risk profile is greater compared to nonablative therapy; however, nonablative therapy offers only minor improvements in cosmetic appearance of atrophic and acne scars. Low-dose, superficial radiotherapy is sometimes used to prevent recurrence of severe keloid and hypertrophic scarring. It is thought to be effective despite a lack of clinical trials, but only used in extreme cases due to the perceived risk of long-term side effects. Silicone scar treatments are commonly used in preventing scar formation and improving existing scar appearance. A meta-study by the Cochrane collaboration found weak evidence that silicone gel sheeting helps prevent scarring. But the studies examining it were of poor quality and susceptible to bias. Pressure dressings are commonly used in managing burn and hypertrophic scars, although supporting evidence is lacking. Care providers commonly report improvements, however, and pressure therapy has been effective in treating ear keloids. The general acceptance of the treatment as effective may prevent it from being further studied in clinical trials. A long-term course of corticosteroid injections into the scar may help flatten and soften the appearance of keloid or hypertrophic scars. Scarring caused by acne (left), and photo one day after scar revision surgery: The area around sutures is still swollen from surgery. Scar revision is a process of cutting the scar tissue out. After the excision, the new wound is usually closed up to heal by primary intention, instead of secondary intention. Deeper cuts need a multilayered closure to heal optimally, otherwise depressed or dented scars can result. Surgical excision of hypertrophic or keloid scars is often associated to other methods, such as pressotherapy or silicone gel sheeting. Lone excision of keloid scars, however, shows a recurrence rate close to 45%. A clinical study is currently ongoing to assess the benefits of a treatment combining surgery and laser-assisted healing in hypertrophic or keloid scars. Subcision is a process used to treat deep rolling scars left behind by acne or other skin diseases. It is also used to lessen the appearance of severe glabella lines, though its effectiveness in this application is debatable. Essentially the process involves separating the skin tissue in the affected area from the deeper scar tissue. This allows the blood to pool under the affected area, eventually causing the deep rolling scar to level off with the rest of the skin area. Once the skin has leveled, treatments such as laser resurfacing, microdermabrasion or chemical peels can be used to smooth out the scarred tissue. Research shows the use of vitamin E and onion extract (sold as Mederma) as treatments for scars is ineffective. Vitamin E causes contact dermatitis in up to 33% of users and in some cases it may worsen scar appearance. But Vitamin C and some of its esters fade the dark pigment associated with some scars. Cosmetics; Medical makeup can temporarily conceal scars. This is most commonly used for facial scars. Dermabrasion involves the removal of the surface of the skin with special equipment, and usually involves a local anaesthetic. Massage has weak evidence of efficacy in scar management. Any beneficial effect appears to be greater in wounds created by surgical incision than traumatic wounds or burn wounds. The permanence of scarring has led to its intentional use as a form of body art within some cultures and subcultures. These forms of ritual and non-ritual scarring practices can be found in many groups and cultures around the world. First attested in English in the late 14th century CE, the word scar derives from Old French escharre, from Late Latin eschara, which is the latinisation of the Greek ἐσχάρα (eskhara), meaning "hearth, fireplace", but in medicine "scab, eschar on a wound caused by burning or otherwise". An intradermal injection of transforming growth factor beta 3 (TGFβ3) is being tested. The results of three trials already completed were published in the Lancet along with an editorial commentary. A study implicated the protein ribosomal s6 kinase (RSK) in the formation of scar tissue and found the introduction of a chemical to counteract RSK could halt the formation of cirrhosis. This treatment also has the potential to reduce or even prevent altogether other types of scarring. Research has also implicated osteopontin in scarring. 1 2 Sherratt, Jonathan A. (2010). "Mathematical Modelling of Scar Tissue Formation". Department of Mathematics, Heriot-Watt University. Retrieved 20 August 2010. This is composed of the same main protein (collagen) as normal skin, but with differences in details of composition. Most crucially, the protein fibres in normal tissue have a random (basketweave) appearance, while those in scar tissue have pronounced alignment in a single direction. 1 2 3 Gauglitz GG, Korting HC, Pavicic T, Ruzicka T, Jeschke MG (January–February 2011). "Hypertrophic Scarring and Keloids: Pathomechanisms and Current and Emerging Treatment Strategies". Mol Med. 17 (1-2): 113–125. doi:10.2119/molmed.2009.00153. PMC 3022978 . PMID 20927486. ↑ Kelly AP (2009). "Update on the Management of Keloids". Seminars in Cutaneous Medicine and Surgery. 28 (2): 71–76. doi:10.1016/j.sder.2009.04.002. PMID 19608056. ↑ Roseborough IE, Grevious MA, Lee RC (January 2004). "Prevention and treatment of excessive dermal scarring". J Natl Med Assoc. 96 (1): 108–16. PMC 2594768 . PMID 14746360. ↑ Martini, Frederic H. (2006). Fundamentals of Anatomy & Physiology, Seventh Edition, p. 171. Benjamin Cummings, San Francisco. ↑ Goodman GJ (2000). "Postacne scarring: A review of its pathophysiology and treatment". Dermatologic Surgery. 26 (9): 857–871. doi:10.1046/j.1524-4725.2000.99232.x. PMID 10971560. ↑ Fabbrocini G, Annunziata MC, D'Arco V, De Vita V, Lodi G, Mauriello MC, Pastore F, Monfrecola G (2010). "Acne Scars: Pathogenesis, Classification and Treatment". Dermatology Research and Practice. 2010: 1–13. doi:10.1155/2010/893080. PMC 2958495 . PMID 20981308. ↑ Elsaie ML, Baumann LS, Elsaaiee LT (2009). "Striae Distensae (Stretch Marks) and Different Modalities of Therapy: An Update". Dermatologic Surgery. 35 (4): 563–573. doi:10.1111/j.1524-4725.2009.01094.x. PMID 19400881. ↑ Hengge UR, Ruzicka T, Schwartz RA, Cork MJ (2006). "Adverse effects of topical glucocorticosteroids". Journal of the American Academy of Dermatology. 54 (1): 1–15. doi:10.1016/j.jaad.2005.01.010. PMID 16384751. ↑ "Endometrial repair". princehenrys.org. 18 September 2012. Retrieved 30 June 2013. Importantly, the endometrium is the only adult tissue to undergo rapid cyclic repair without scarring. 1 2 Parlange, Mary (17 December 2007). "New mechanical insights into wound healing and scar tissue formation". École Polytechnique Fédérale de Lausanne. eurekalert.org. Retrieved 28 August 2010. The body launches a complex rescue operation. Specialized cells called fibroblasts lurking just beneath the surface of the skin jump into action, enter the provisional wound matrix (the clot) and start secreting collagen to close the wound as fast as possible. ↑ Chen J, Jia-Han W, Hong-Xing Z (September 2005). "Inhibitory effects of local pretreated epidermis on wound scarring: a feasible method to minimize surgical scars". Burns. 31 (6): 758–64. doi:10.1016/j.burns.2005.04.002. PMID 16006045. ↑ Wipff PJ, Rifkin DB, Meister JJ, Hinz B (December 2007). "Myofibroblast contraction activates latent TGF-beta1 from the extracellular matrix". The Journal of Cell Biology. 179 (6): 1311–23. doi:10.1083/jcb.200704042. PMC 2140013 . PMID 18086923. Lay summary – École Polytechnique Fédérale de Lausanne (December 17, 2007). ↑ Parlange, Mary (17 December 2007). "New mechanical insights into wound healing and scar tissue formation". École Polytechnique Fédérale de Lausanne. eurekalert.org. Retrieved 28 August 2010. The matrix grows stiffer and, at a certain point, the fibroblasts stop migrating and, like Popeye, change into powerful contractile cells, anchoring themselves to the matrix and pulling the edges of the wound together. ↑ Traci A. Wilgus (9 March 2008). "Regenerative Healing in Fetal Skin: A Review of the Literature". o-wm.com. Retrieved 26 March 2011. Aside from normal fibroblasts, myofibroblasts, specialized contractile fibroblasts, also can contribute to wound repair. These cells express a-smooth muscle actin (a-SMA) and are characterized using transmission electron microscopy by a well-developed rough endoplasmic reticulum, nuclei with irregular borders, secretory vesicles denoting active collagen synthesis, and organized microfilament bundles. 1 2 Traci A. Wilgus (9 March 2008). "Regenerative Healing in Fetal Skin: A Review of the Literature". o-wm.com. Retrieved 26 March 2011. Studies in sheep have indicated that myofibroblasts are absent in early scarless fetal wounds but are present during healing at later stages when prominent scarring occurs. In addition, incisional or small excisional wounds (2 mm) heal without a scar and do not contain myofibroblasts. In contrast, larger excisional wounds that heal with a scar contain strong a-SMA staining, with the number of myofibroblasts correlating with the size of the wound and amount of scarring. ↑ Leask, Andrew (23 September 2008). "When Healing Turns To Scarring: Research Reveals Why It Happens And How To Stop It". the Canadian Foundation for Innovation, CIHR, the Arthritis Research Campaign, the Reynaud's and Scleroderma Foundation, and the Scleroderma Society. : sciencedaily.com. Retrieved 26 February 2011. During tissue repair, specialized cells called myofibroblasts migrate to the wound where they generate the adhesive and tensile forces required for wound closure. Normally, these myofibroblasts then disappear from the wound. But if they persist and continue to make connective tissue, it can become too thick, preventing the organ from functioning properly. ↑ Ferguson MW, O'Kane S (May 2004). "Scar-free healing: from embryonic mechanisms to adult therapeutic intervention". Philos. Trans. R. Soc. Lond., B, Biol. Sci. 359 (1445): 839–50. doi:10.1098/rstb.2004.1475. PMC 1693363 . PMID 15293811. ↑ Khunger N (January 2008). "Standard guidelines of care for acne surgery". Indian Journal of Dermatology, Venereology and Leprology. 74 Suppl: S28–36. PMID 18688101. ↑ Khunger N (January 2008). "Standard guidelines of care for chemical peels". Indian Journal of Dermatology, Venereology and Leprology. 74 Suppl: S5–12. PMID 18688104. ↑ Cooper JS, Lee BT (December 2009). "Treatment of facial scarring: lasers, filler, and nonoperative techniques". Facial Plastic Surgery. 25 (5): 311–5. doi:10.1055/s-0029-1243079. PMID 20024872. ↑ Lemperle G, Rullan PP, Gauthier-Hazan N (September 2006). "Avoiding and treating dermal filler complications". Plastic and Reconstructive Surgery. 118 (3 Suppl): 92S–107S. doi:10.1097/01.prs.0000234672.69287.77. PMID 16936549. 1 2 Elsaie ML, Choudhary S (November 2010). "Lasers for scars: a review and evidence-based appraisal". Journal of Drugs in Dermatology. 9 (11): 1355–62. PMID 21061757. ↑ Khatri KA, Mahoney DL, McCartney MJ (April 2011). "Laser scar revision: A review". Journal of Cosmetic and Laser Therapy. 13 (2): 54–62. doi:10.3109/14764172.2011.564625. PMID 21401378. ↑ Ogawa R, Yoshitatsu S, Yoshida K, Miyashita T (October 2009). "Is radiation therapy for keloids acceptable? The risk of radiation-induced carcinogenesis". Plastic and Reconstructive Surgery. 124 (4): 1196–201. doi:10.1097/PRS.0b013e3181b5a3ae. PMID 19935303. ↑ Stavrou D, Weissman O, Winkler E, Yankelson L, Millet E, Mushin OP, Liran A, Haik J (October 2010). "Silicone-based scar therapy: a review of the literature". Aesthetic Plastic Surgery. 34 (5): 646–51. doi:10.1007/s00266-010-9496-8. PMID 20354695. 1 2 O'Brien, L; Jones, DJ (12 September 2013). "Silicone gel sheeting for preventing and treating hypertrophic and keloid scars.". The Cochrane database of systematic reviews. 9: CD003826. doi:10.1002/14651858.CD003826.pub3. PMID 24030657. 1 2 3 4 Shih R, Waltzman J, Evans GR (March 2007). "Review of over-the-counter topical scar treatment products". Plastic and Reconstructive Surgery. 119 (3): 1091–5. doi:10.1097/01.prs.0000255814.75012.35. PMID 17312518. ↑ Roques C, Téot L (2008). "The Use of Corticosteroids to Treat Keloids: A Review". The International Journal of Lower Extremity Wounds. 7 (3): 137–145. doi:10.1177/1534734608320786. PMID 18611924. 1 2 Jenkins M, Alexander JW, MacMillan BG, Waymack JP, Kopcha R. Failure of topical steroids and vitamin E to reduce postoperative scar formation following reconstructive surgery. J Burn Care Rehabil. 1986 Jul–Aug;7(4):309–312. ↑ Farris PK. Topical vitamin C: a useful agent for treating photoaging and other dermatologic conditions. Although many people claim that vitamin therapy does in fact help. Dermatol Surg 2005;31:814-818. ↑ Mee, Donna; Wong, Brian (2012-10-01). "Medical Makeup for Concealing Facial Scars" (PDF). Facial Plastic Surgery. 28 (05): 536–540. doi:10.1055/s-0032-1325647. PMID 23027221. ↑ Shin, Thuzar M.; Bordeaux, Jeremy S. (2012). "The Role of Massage in Scar Management: A Literature Review". Dermatologic Surgery. 38 (3): 414–423. doi:10.1111/j.1524-4725.2011.02201.x. ISSN 1076-0512. ↑ Cohen, BE; Elbuluk, N (February 2016). "Microneedling in skin of color: A review of uses and efficacy.". Journal of the American Academy of Dermatology. 74 (2): 348–55. PMID 26549251. ↑ "Liver damage 'could be reversed'". BBC News. 27 December 2007. Retrieved 1 January 2008. ↑ "Gel 'to speed up wound healing'". BBC News. 22 January 2008. Retrieved 23 May 2010. American Academy of Dermatology: "What is a scar?"